With the merger, the content of our professional meetings and scientific symposia has been broadened to accommodate the interests of psychologists in quantitative EEG and all PhDs interested in EEG and clinical neuroscience. It provides an optimal avenue to keep up-to-date with major advances, promote developments and project our identity in the field. 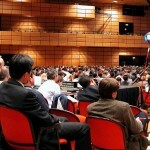 The Annual Meetings target clinicians and researchers with interest in neurobehavioral disoorders. This includes neuroscientists, neurologists, psychiatrists, psychologists, Biomedical and Electrical engineers.